British Columbia is in the midst of an economic boom. Expectations are that the Vancouver 2010 Olympics will pump between $5.8 billion and $10 billion worth of new activity into the British Columbia economy by the time the Olympic flame is extinguished in 2010. RBC Financial Group economist Derek Holt estimates that the Olympics could boost the size of B.C.’s economy by as much as 1.2 percentage points per year, with the economic lift adding up to two-times that amount in 2010. “This is a significant, positive lift to long-term growth prospects in B.C.,” Holt wrote in a November report. John Furlong, president of the Vancouver Olympic Organizing Committee, has said that Holt’s forecast would equate to an annual $2.1 billion to $3.3 billion direct and indirect boost to the economy. Furlong noted that Vanoc will eventually award more than 10,000 contracts for goods and services. To date, some 300, worth more than $93 million, have been tendered. Economic impact studies estimate up to 77,000 person years of employment could be generated by the Games with billions of dollars in new construction ranging from $660 million on direct venue spending and billions of dollars on indirect projects ranging from the Sea to Sky Highway upgrade, Canada Line rapid transit line and Vancouver Convention and Exhibition Centre expansion. Vanoc will contribute some $145.6 million to projects in 2006 including the upgrading of facilities at Cypress Mountain for the Olympics’ freestyle skiing and snowboarding events, construction of a new arena at the University of B.C. and the tenders for athletes villages in Vancouver and Whistler. Venue costs, however, could escalate substantially before the games take place. The Independent Contractors and Businesses Association of B.C. estimates that construction costs in B.C. could rise 50 per cent by 2010. Right now, companies beyond big construction firms are beginning to capitalize on the Games in some surprising ways. Sitka Log Homes in 100 Mile House, for instance, won a $2.9-million contract from the provincial and federal governments to provide a log building for the B.C. Canada Place at the Turin 2006 Olympics in February. While the Turin project isn’t directly part of the Games, Bramsleven is optimistic that his 30-employee firm in B.C.’s interior will receive additional benefits, not only for the 2010 Games but beyond. “There’s going to be a lot of private-venture developments that are happening and a lot of those will be log and timber buildings, we would expect,” Bramsleven said. Economic Development Minister Colin Hansen, the minister in charge of B.C.’s Olympics secretariat, said the province is borrowing ideas tried by other Olympic jurisdictions and improving on them to make sure British Columbians wring all the opportunities that they can from the Games. For example, the B.C. Olympics secretariat created the 2010 Commerce Centre, a spot where all Olympics-related contracts that are put out to tender are posted and can be accessed online. The provincial government also created the arm’s-length 2010 Legacies Now, a non-profit society aimed at encouraging and helping communities to initiate projects in sports and the arts, linked to the Games, that will have lasting impacts on their health and social wellbeing. Hansen said his Olympics Secretariat, through the Commerce Centre, is also trying to encourage the winning bidders on venue construction and other large jobs to do their own purchasing through the centre as well to leverage all the local opportunities they can out of the Games. “The role of the Olympic Secretariat is to strategize and implement programs that will allow us to maximize the ongoing benefits that will result from the Olympic Games,” Hansen said. Bruce Dewar, chief operating officer of 2010 Legacies Now, added that some 94 communities have set up Spirit of 2010 committees to try and find ways to participate in and benefit from the Games. Many of the benefits are expected to come in the areas of sports and the arts, but Dewar said some efforts will also have economic benefits. He noted that through Legacies Now’s “sports hosting” program, some communities, such as Prince George, are lobbying to serve as a pre-Olympics training venue for some of the teams coming to the Games. That, Dewar said, helps set communities up to market themselves as sports-tourism destinations, which is one of the fastest-growing segments of tourism. So far, he noted, Legacies Now has handed out some $461,000 in grants to communities. “[Communities] are really opening up their minds about what these Games can bring,” Dewar said. Hansen added that B.C. didn’t pursue the Games just to host a major sporting event, it pursued them because it is a chance to showcase B.C. to the world. British Columbia is in the midst of a construction boom with some $83 billion in major capital projects listed in the B.C. government’s major projects inventory and contractors scrambling to find skilled tradespeople to do all the work. In 2005, B.C. also recorded some 31,043 housing starts — the second-highest number on record after 1994, according to statistics from the Canada Mortgage and Housing Corp.
And while CMHC predicts starts will plateau at the 31,000 level in 2006, non-residential construction could continue to rise. To the end of November 2005, B.C. builders took out residential building permits worth $6.3 billion, up 14.9 per cent from 2004. Non-residential permits for all of 2005, however — for retail stores and offices, schools and hospitals — were up a whopping 25.8 per cent to $3.9 billion. Philip Hochstein, executive vice-president of the Independent Contractors and Business Association of B.C., said there is always a lag between growth spurts in residential development and non-residential construction. “You don’t build a new shopping centre unless you’ve got new subdivisions,” Hochstein said, and B.C. has built lots of new subdivisions, so shopping centres, schools, hospitals and offices are following. 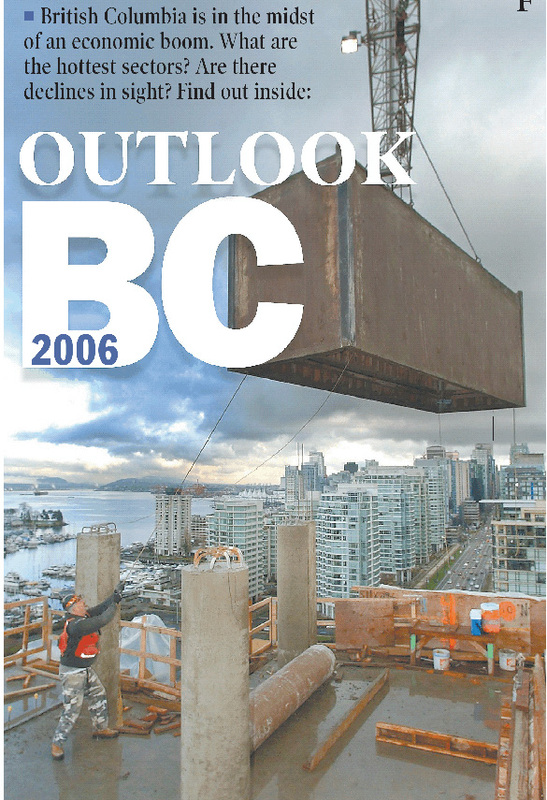 “In my whole 18 years, 20 years [in the sector], I’ve never seen the construction industry in British Columbia so buoyant, so optimistic, so pumped up,” Hochstein said of 2005. Manley McLachlan, president of the B.C. Construction Association, said construction levels are up all over the province. He cited an anecdote from a Prince George-based contractor who was organizing a construction trade show and looking for pieces of heavy equipment that could be used as displays. A year ago, operators made as many as 40 machines available. “[The organizer] said [this year] he couldn’t find four that weren’t working,” he said. McLachlan said that in northern B.C., projects include the Prince Rupert port expansion and Enbridge Inc.’s $1.9-billion Gateway pipeline project to pump oil from Alberta’s oil sands to the B.C. coast. The construction boom has brought big gains in the industry’s employment levels. In December, Statistics Canada’s labour force survey counted some 178,800 construction workers in the workforce, a 14-per-cent increase from a year ago. But Sashaw said finding skilled workers to build all the proposed projects is an increasing challenge, one that will be with the industry for some time as the workforce ages. A 2001 industry analysis of the construction workforce found the average age of a qualified tradesperson was 42. Now, he said, the average age in some trades is 48, which means a considerable labour deficit is looming due to retirement. Hochstein said rising costs and changing bank rates are some of the unpredictable variables that will determine whether the construction boom continues. The ICBA released research Monday that showed construction costs have gone up 45 per cent since 2000 and could balloon by an additional 55 per cent by the end of the decade. McLachlan said while there are some concerns over labour shortages, no one is complaining about the current general economic conditions. Source: Statistics Canada, Service Canada, Credit Union Central of B.C. **Forecast, Credit Union Central B.C. 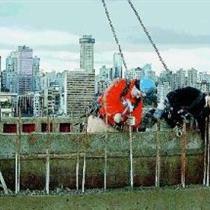 British Columbia started 2006 in the midst of an economic boom the likes of which it hasn’t seen in more than 20 years. And that remarkable growth is likely to continue until the end of the decade, fuelled by strong global demand for the province’s resources and a multi-billion-dollar construction sector expansion. The economy added 79,700 jobs in 2005, driving the unemployment rate to a 30-year low. The prospects for 2006 are for increasing employment as industries struggle to keep up with demand for workers to support projected growth. Mining saw a $200-million injection into mineral exploration in 2005, the highest amount in more than a decade as companies scramble to find new resources that can feed Asia’s insatiable demand for copper, zinc, coal and other resources, which are hitting record high prices on world markets. Mining, fishing, trapping and forestry-support sectors, as well as construction, retail trade and the financial industries are expected to be the fastest-growing sectors of the economy. The fishing and trapping category, an amalgamation of several small sectors that will add up to just $739 million of the economy in 2006, is predicted to see 10.7-per-cent growth over last year. Companies also pumped up the provincial government’s inventory of current and future major construction projects to $83 billion from $68 billion a year ago. Projects contemplated include major infrastructure initiatives, such as Enbridge Inc.’s proposed 1,150-kilometre, $1.9-billion Gateway pipeline to carry oil from the Alberta oilsands across B.C. to Kitimat on the coast. Billions more in investment are being contemplated to upgrade B.C.’s ports and improve road and rail transportation links in light of the province’s overall strategy to create Canada’s gateway to the booming Asia-Pacific region. Helmut Pastrick, chief economist for Credit Union Central B.C., expects that the global economy will continue to expand, the United States economy will remain strong, and that investment spending in B.C. will continue to keep up with it all. “I view that this growth-cycle phase we’re in will extend further and perhaps be more robust than [other economists],” Pastrick said. Pastrick, in Credit Union Central B.C.’s most recent provincial forecast, estimated that the economy “will be in a faster growth phase” until 2010, and could grow by as much as 20 per cent over the next five years. That is higher than the previous five years, which saw the economy grow some 15 per cent between 2001 and 2005. Labour shortages will factor into the forecast, Pastrick added, both on the positive and negative sides. The Credit Union Central’s projection is that the workforce will grow by some three-per-cent per year until 2008, which will help to keep unemployment at record low levels within a workforce that is aging and shrinking. Pastrick noted that wages have begun to rise in response to tighter labour supplies, which in turn increases the cost to build and make things. “But [rising wages are] not necessarily a bad thing,” he said. “Higher wages mean higher incomes,” and better incomes, mean more consumer spending power. For 2006, Pastrick estimates that growth in consumer spending will translate into some $53 billion in retail sales in B.C. stores. Canada Mortgage and Housing Corp. also believes that rising wages and continued positive migration numbers will support strong demand for housing. The federal agency is projecting an estimated 31,000 new housing starts across B.C. in 2006 and some 95,000 total real estate sales. Other economists, however, worry that a constrained labour supply could hold back some of B.C.’s growth. David Baxter, director of the Urban Futures Institute, a demographics and economic forecasting firm, noted that Alberta’s economy is also “roaring ahead” at the same time as B.C., so it could be difficult to find all the workers it needs to take on all the projects being contemplated. “When we talk about interprovincial migration, we have to talk about where all those folks are going to come from,” Baxter said. He added that Alberta, Saskatchewan and Quebec also posted record low unemployment rates in 2005, which will cause those provinces to draw workers to them. “We look forward in time and say we’re going to have a modest labour supply constraint,” Baxter said. However, Baxter still predicts that B.C. will see healthy economic growth. Rising construction costs could also affect B.C.’s ability to grow. The Independent Contractors and Businesses Association of B.C., borrowing the estimate of a major construction quantity surveyor, forecasts that construction costs could rise more than 50 per cent by 2010. 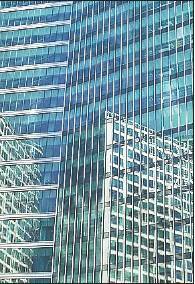 That, the ICBA noted, follows a five-year period between 2000 and 2005 where construction costs rose 45 per cent. Much of the growth will be fuelled by the booming resource sectors, mining and oil and gas exploration. Experts in the oil and gas sector are predicting that natural gas prices will remain above $9 US per thousand cubic feet, a level that is expected to propel drilling activity in B.C.’s booming northeast to increase by some 20 per cent in 2006. Miners too are scrambling to keep up with global demand for commodities such as coal and copper. It’s predicted that zinc, gold and silver will all remain hot commodities, which is all good for B.C. Technology industries are also enjoying a robust recovery from the tech meltdown of 2001. A recent study conducted by the University of B.C.’s Sauder School of Business for the technology promotion agency Leading Edge B.C. concluded that B.C. tech companies had the best return on investment in North America. B.C. was a hot spot for technology takeovers in 2005, such as Kodak’s $1-billion takeover of local imaging firm Creo, and PureEdge Solutions by IBM. Now Leading Edge president George Hunter has noticed that early-stage tech firms are having an easier time finding first-level financing. He said B.C. leads Canada in terms of the amount of money available to new companies, and predicts an unprecedented amount of activity in tech startups. B.C.’s biotechnology sector is also positioning itself for growth. The provincial government, last September, introduced a tax break for profits earned on life-science-related intellectual property, so long as firms keep the ownership of those patents in B.C. Karimah Es Sabar, executive director of B.C. Biotech, is characterizing B.C.’s big picture for biotech’s future as good, and is focusing her efforts on building relations between this province and Europe’s burgeoning life-sciences sector. The province’s film industry is also enjoying a resurgence, also with some tax help from the provincial government. BASF plans to set up shop in B.C. British Columbia’s International Finance Centre scored a coup Monday with the announcement by BASF Corp., the North American affiliate of the multi-billion dollar German chemical giant BASF AG, that it is opening a financial subsidiary here to take advantage of the province’s corporate tax breaks. The announcement marks the first major international company to set up shop in the province as a result of corporate tax breaks here, and it signifies a win for B.C. over competing jurisdictions across North America. “I think it is a coup, this is the first big international firm that we have signed up under the International Financial Activities Act,” said Robert Fairweather, president of B.C.’s International Financial Centre. “Our membership to date has basically been Canadian-based companies that have moved an office or established an office here to take advantage of the legislation. Fairweather is heading to Turin in late February to do a post-Olympics seminar at Canada House pitching European multinationals on B.C.’s International Financial Activity Act, which gives a 100-per-cent tax break on provincial corporate income taxes for certain activities. Companies that have specialists employed in operations qualifying under the act are also eligible for a 75-per-cent refund of provincial personal income tax. The act covers financial, administrative, and support activities, including international film distribution and most recently it was expanded to include revenue from intellectual property earned outside the country. BASF, which employs 10,000 people in North America and 82,000 worldwide, tallied North American sales of $11 billion in 2004 and more than $50 billion in global sales. The company’s North American financial centre is based in New Jersey and some of those operations are being moved to New Westminster with a promise of expansion to follow. In a release announcing the company’s entrance into B.C., Robin Rotenberg, president of BASF Canada, said it is part of the company’s growth in North America. Fairweather said while the opening of the BASF operations here only means a few jobs initially, that number is expected to grow. Posted in Technology Related Articles | Comments Off on BASF plans to set up shop in B.C. A major British Columbia construction-sector association is warning that the cost to build in B.C. will climb 55 per cent by 2010, putting efforts such as the province’s Gateway infrastructure project in jeopardy if planners don’t account for rising prices. Philip Hochstein, president of the Independent Contractors and Businesses Association of B.C., said his organization has compiled research that shows construction costs have ballooned 45 per cent since 2000. The forecast 55-per-cent jump in costs means construction expenses will have doubled in the 10 years leading up to the 2010 Olympic Games. Hochstein said rapidly rising construction wages, which were depressed during the 1990s, are the main culprit. Until now, he added, rising material costs “have been masked” by stagnant wages and by companies that shaved profit margins to win business during lean times. However, the sector is now in a boom, and companies and workers are trying to catch up, which is biting into construction budgets. Hochstein counselled caution for those looking to hire contractors, such as the provincial government, which has billions in infrastructure projects planned, including the $3-billion Gateway transportation initiative. B.C. Transportation Minister Kevin Falcon did not respond to a request for an interview Monday. Ballooning construction costs are also plaguing the Vancouver 2010 Winter Olympics. Vancouver Organizing Committee CEO John Furlong, late last year, warned that inflation would increase the prices to build venues that Vanoc had stated in the bid it submitted to win the Games. Last fall, Furlong made a request to both the federal and provincial governments for additional money. However, as late as last week, Furlong delayed plans to unveil the scope of Vanoc’s construction-cost overruns. A Vanoc representative did not respond to a request for an interview Monday. Colin Hansen, B.C.’s minister of Economic Development, was not available for an interview Monday, but during a scrum with reporters in Davos, Switzerland, Hansen said he believes rising costs won’t break the province’s budget for the Games. “I’m very confident, with where we are now and the work that’s been done, that the allocation that we’ve made as a province is going to be adequate,” Hansen said. Others in the construction sector remain skeptical that construction inflation will remain as steep as the ICBA is stating for as long as it is anticipating. Keith Sashaw, president of the Vancouver Regional Construction Association, said he expects that an easing in residential construction activity, which is expected to begin in 2006, will ease the pressure on costs. As well, Sashaw said construction costs are influenced by global trends, and if there is a downturn in economic conditions elsewhere in North America it will also mitigate rising costs. “I don’t think it would be too accurate to take a look at what’s happened in B.C. over the last year, and what we expect to happen this year, and straight-line [the estimate] out to 2010,” Sashaw said. Hochstein said the ICBA based its expectations for inflation on the forecast of BTY Group, a major construction quantity surveyor in B.C. The BTY Group projection is for construction costs in B.C. to spike upward by 11 per cent in 2006, 10 per cent in each of 2007 and 2008 then tail off to eight per cent in 2010. Hochstein said the provincial and federal governments could ease one driver of cost inflation by streamlining immigration rules for skilled tradespeople to enter Canada to work in construction. Hochstein said so many trainees have entered the construction workforce in recent years that it has hurt the sector’s productivity. 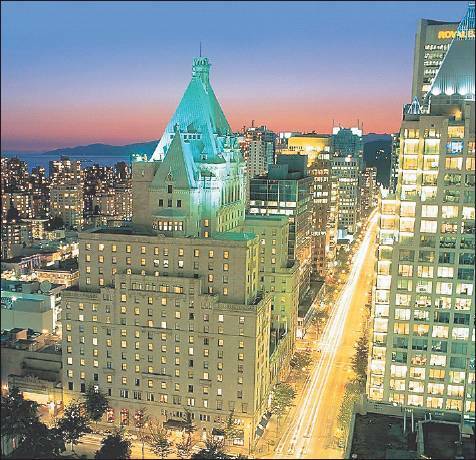 The Fairmont Hotel Vancouver is one of the hotels included in a friendly takeover bid. Canadian hotel operator Fairmont Hotels & Resorts — which traces its origins back to the historic Canadian Pacific Railway hotel chain — has agreed to be acquired by Saudi prince Alwaleed bin Talal and U.S. property magnate Thomas Barrack in a $3.9-billion US deal announced Monday. The 87-hotel Fairmont chain — with three Vancouver hotels and a fourth under development — will merge with Barrack’s 33-hotel Raffles Hotels chain, but the two brands will stay separate and Fairmont will remain an independent hotel company headquartered in Toronto. The deal comes after Fairmont had earlier rejected a takeover bid from U.S. billionaire Carl Icahn, who assembled a 10-per-cent stake in Fairmont last year before bidding $40 US a share for 51 per cent of the company. Alwaleed’s Kingdom Hotels International and Barrack’s Colony Capital will pay $45 US a share under the deal, which requires the approval of at least two thirds of shareholders at a meeting expected to be held in April. The offer adds up to about $3.3 billion US in cash, but will also include an assumption of debt that brings the total closer to $3.9 billion. Alwaleed, the world’s fifth-richest person with assets estimated at more than $23 billion US, already has a 23-per-cent interest in upscale Canadian hotel chain Four Seasons Hotels. Barrack owns luxury hotel and recreation properties throughout the world, including the Las Vegas Hilton, the Stanhope Hotel in New York and Accor Casinos in Europe. Fatt said the two acquiring companies have made a strong commitment to keeping Fairmont’s head office in Canada. The Toronto-based chain owns and operates 87 hotels with about 34,000 guest rooms in Canada, the U.S., Mexico, Bermuda, Barbados, Britain, Monaco, Kenya and the United Arab Emirates. Fairmont also owns Delta Hotels, which manages and franchises 38 properties. Some of the most prominent Fairmont properties in Canada include the Banff Springs, Chateau Laurier and Royal York hotels. B.C. 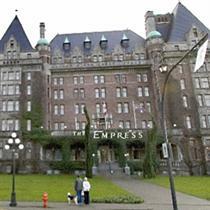 Fairmont properties include the Empress in Victoria, the Chateau Whistler in Whistler, the Vancouver Airport in Richmond and the Hotel Vancouver and the Waterfront in Vancouver. Another Vancouver Fairmont hotel — the 415-room Fairmont Pacific Rim — is under development near the downtown convention centre and is scheduled to open in 2009. It’s part of a $350-million hotel/condominium project being built by Westbank Properties, and Westbank president Ian Gillespie said the Fairmont buyout is good news for the project. Kingdom Hotels and Colony Capital are to pay $3.9 billion US to purchase the Fairmont chain. Kingdom Hotels is owned by Prince Alwaleed bin Talal bin Addulaziz Alsaud, a member of the Saudi Arabian royal family listed by Forbes magazine as the world’s fifth-richest person with a net worth of $23.7 billion US. – The buyout: Will create a 120-hotel chain by combining 87 Fairmont hotels with 33 Raffles hotel properties. – The B.C. holdings: Hotel Vancouver, Vancouver Airport Hotel, Fairmont Waterfront, and the Fairmont Pacific Rim Hotel, which is under construction. Holdings outside of Vancouver include: The Empress Hotel in Victoria and the Chateau Whistler. – The history: Fairmont originated as the operator of the Canadian Pacific Railway’s chain of grand hotels, among them the Hotel Vancouver, Banff Springs, Chateau Lake Louise, Chateau Frontenac and Royal York. It built landmark hotels in cities across Canada, then acquired the CN hotel chain in 1988, Princess Hotels in 1998 and U.S.-based Fairmont in 1999. It was spun off in the breakup of Canadian Pacific Ltd. in 2001. VICTORIA — A $3-billion plan aimed at staving off gridlock in the Lower Mainland will be revealed today, with plans for more and bigger bridges, wider and longer highways and more green-friendly bicycle lanes for the next decade and beyond. But the B.C. government warns that if Vancouver and its satellite cities want to avoid becoming the Los Angeles of the North, they’d better start reining in their love for cars. It wants them to fork out tolls every time they take their vehicles across that vital link over the Fraser River — the Port Mann Bridge. In the future, concludes a report obtained by The Vancouver Sun, drivers who cross a revitalized Port Mann Bridge should pay about $2.50 per crossing. That will be collected from credit cards through electronic tolls, or, for those who aren’t registered, through cameras taking snapshots of their licence plates, with the bill being sent to them later. “A potential toll on the Port Mann Bridge could be in the order of $2.50 each way for private vehicles,” says the government’s executive summary of the plan, which will be put to public hearings. But even as it tries to control the use of cars, the government is planning some major expenditures to make it easier for those who must use them to get in and out of the city. – $1.5 billion: This is for the twinning of the Port Mann Bridge and the highway that leads to it. This includes construction of an additional two lanes on Highway 1 and the Port Mann Bridge twinning, which will mean a second, new bridge supported by cables. It includes bicycle lanes and an engineering plan allowing for the future inclusion of a light-transit railway line when merited by the population and traffic. – $800 million: This is to build a four-lane, 80 km/h highway on the south shore of the Fraser River, from Delta to the Golden Ears Bridge, with a connection to the important trade artery of Highway 1. – $400 million. This is for the North Fraser Perimeter Road, an improved highway from New Westminster to Maple Ridge. It will include a new seven-lane bridge to replace the Pitt River swing bridges, which will ease flow into existing highways. – $300 million. This is for a contingency fund in case the projects go over budget. The B.C. government has not yet said if it will be using free-market partners — the so-called private, public P-3 partnerships — to build the new roadways and bridges. That will likely subject it to scrutiny from the New Democratic Party, which believes P3 partnerships are more costly to taxpayers in the long run. The executive summary of the government’s Gateway Program report says the Lower Mainland’s new network will save the British Columbia economy anywhere from $500 million to $1.5 billion because of increased efficiency in commuter and commercial transportation costs and lost time to workers. While there may be debate about the architecture of the new roadways and bridges, the provincial government believes there’s no real challenge to the economic argument. But the government also is proposing some disincentives to using the car. It will spend $50 million on bike paths to encourage people to use bicycles when possible. The expenditure will be the biggest in B.C. for a regional cycling network, setting a precedent to encourage municipalities to link bicycle networks to major highways. The government is also hoping to get more commuters into the same car. It hopes that tolls will be weighted in favour of the conscientious commuter and mean the investment in the Port Mann Bridge would mean less congestion for decades, rather than a few years. “The rate [toll] for trucks could, if implemented, be higher, while the rate for motorcycles could be lower…,” the government proposes, suggesting that night-time users could even cross for free. Without the discipline of tolls, the government argues, the benefits of the $1.5-billion project would be mostly eliminated. For the twinning of the Port Mann Bridge (circled, above). For the North Fraser Perimeter Road (green), improvements to existing roads to provide a continuous route from New Westminster to Maple Ridge. 1. South Fraser Perimeter Road: A proposed four-lane 80-kilometre route along the south side of the Fraser River, from Deltaport Way in Delta to the connector road leading to the proposed Golden Ears Bridge at the Langley-Surrey border. To be completed by 2012. Cost: $800 million. 2. North Fraser Perimeter Road: Improvements to existing roads to provide a continuous route from New Westminster to Maple Ridge. Cost: Includes a new seven-lane bridge to replace the existing Pitt River swing bridge and an improved interchange at Lougheed Highway and the Mary Hill Bypass. To be completed by 2009. Cost: $400 million. 3. Port Mann Bridge and Highway 1: Twinning of the bridge and adding one lane to Highway 1 in each direction between Vancouver and Langley. To be completed by 2013. The new bridge, to be built immediately west of the existing one, would accommodate transit, pedestrians, cyclists and future light rail transit. Cost: $1.5 billion. Consquences of not twinning: Traffic backs up five km during morning rush at the Port Mann bridge to 176th Street. by 2011 this congestion is expected to increase to 12 kilometres — as far as 200th Street. By 2021, traffic could back up as far as 17 kilometres, to 246th Street. By 2011 this congestion is expected to increase to 12 km — as far as 200th. By 2021, traffic could back up as far as 17 km, to 216th Street. 2003: Back then, it was just a five-km lineup to get on the bridge at rush-hour’s peak. 2011: By this date, commuters will probably face a 12-km lineup. 2021: It will be a 17-km-long wait at the Port Mann, according to planners. Yes, Dorothy, you’re still in Langley though you really want to be in Burnaby or Vancouver. Current cost of congestion to truckers in the Lower Mainland is $500 million a year, according to the B.C. Trucking Association. Transport Canada estimates the total extra transportation costs from congestion passed onto commuters is $1.5 billion. 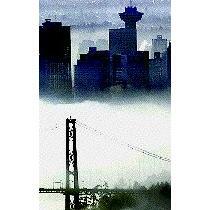 The current Port Mann Bridge is considered to be congested for 13 hours a day. Its traffic is greater than that on San Francisco’s Golden Gate Bridge. The future is getting crowded: The Lower Mainland’s population has grown from 750,000 to 2.1 million in the last 20 years. By 2031, it will be 3 million. By 2031, the government’s planners estimate, 25 to 40 per cent more commuters will need to be part of rush hour. TORONTO — Another Canadian corporate monument is toppling into foreign ownership with a deal for a Saudi prince and an American property magnate to take over Fairmont Hotels & Resorts Inc.
Fairmont, which originated in the historic Canadian Pacific Railway luxury hotel chain and counts the Chateau Laurier, Royal York and Banff Springs among its properties, said yesterday its board is supporting an offer of $3.8 billion, from Kingdom Hotels International and Colony Capital. Including assumed debt, the deal is valued at $4.5 billion. Kingdom Hotels is owned by Saudi Prince Alwaleed bin Talal bin Abdulaziz Alsaud, a global investor listed by Forbes magazine as the world’s fifth-richest person with a net worth of $27.1 billion. He also owns 23 per cent of Toronto-based Four Seasons Hotels Inc. Colony Capital is a Los Angeles private equity firm run by Tom Barrack, recently described by Fortune magazine as the world’s best real-estate investor. Fairmont‘s announcement came five days after Hudson’s Bay Co., Canada’s oldest corporation, agreed to be taken over by American businessman Jerry Zucker. History: Began as the Canadian Pacific Railway’s chain of grand hotels, then acquired CN’s hotel chain in 1988, Princess Hotels in 1998 and U.S.-based Fairmont in 1999. Spun off in the breakup of Canadian Pacific Ltd. in 2001. Fairmont today: Operates 87 high-end properties with 34,000 guest rooms in Canada, the U.S., Mexico, Bermuda, Barbados, Britain, Monaco, Kenya and the United Arab Emirates. Deal: Including debt, $4.5 billion Cdn. Demand for commercial real estate will continue to outstrip supply, Colliers International reports. An already squeezed downtown Vancouver office market will tighten further in 2006, commercial realtor Colliers International is predicting, with the vacancy rate slipping to five per cent sparking “the highest net rental rates in history” within three years. Colliers, in its 2006 Canadian Real Estate Forecast said rising demand for space will surpass supply in downtown Vancouver, hit five-year lows on the Broadway corridor and even begin to become scarce in suburbs such as Burnaby and Surrey. “Looking at triple-A or A [quality] space, it’s going to be difficult to even find space, because the vacancy factor is getting down into the three-per-cent level and even below that in some buildings,” Ron Bagan, Colliers’ managing director for Vancouver said in an interview. Colliers predicts that tenants will absorb some 350,000 square feet of vacant downtown office space, which will pull the overall vacancy rate to five per cent from 6.6 per cent in 2005. Bagan said that as vacancy drops, rents will “move up significantly” and tenants will have to accept increases because rents are still too low to justify the replacement cost of new construction. “We’re not going to see new buildings downtown with significant space for at least three to four years, because there isn’t one on the books or in the planning stages let alone [being put into construction],” Bagan said. The second phase of downtown’s Bentall V project is the last major downtown office project, Bagan said, and many of the remaining suitable sites are zoned for residential use. However, the report also forecasts that rents will rise high enough in response to spur new office developments to be proposed as early as 2007. Bagan said finding industrial space for tenants is even becoming difficult, especially for large spaces over 50,000 square feet, even though a lot of speculative space is being built. The Colliers report noted that companies built four million square feet of new industrial space, yet vacancy in the industrial category hovered at 1.9 per cent, one of the lowest rates in the country. On the retail front, Bagan said 2006 will continue to see growth in shopping-centre development, with more mixed-use and “stacked” retail developments, such as the Canadian Tire and Best Buy project at Cambie and Seventh Avenue in Vancouver. Finding spots in some prime streetfront locations, such as Robson Street, however, will continue to be very difficult, Bagan said. Colliers reported that rents for the most prime spots on Robson hit $200 a square foot in 2005. Vancouver is the most unaffordable city in Canada for housing, and ranks 15th worst in the world, according to a study released last week. The Demographia International Housing Affordability Survey found Vancouver had a housing affordability index of 6.6, measured by the median house price as a ratio of median income. Anything above 5.1 is considered “severely unaffordable,” the report said. Los Angeles topped the world’s cities with an index of 11.2, followed by San Diego and Honolulu, at 10.8 and 10.6 respectively. The most expensive city outside North America was Sydney, Australia with an index of 8.5. The survey looked at median house prices and incomes in 100 cities in the United Kingdom, Ireland, Australia, Canada, New Zealand and the United States. This is the second year for the survey, which was developed to compare housing affordability around the world, the report’s co-author Hugh Pavletich said in a telephone interview from New Zealand. “Historically back in the 1970s and 1980s within the property industry, it was always considered a rough rule of thumb that people should not have to spend any more than three times their household income to buy their homes,” he said. Now as house prices get “out of hand,” this guideline has faded from public view, Pavletich said. He and co-author Wendell Cox, both of whom are experts in urban issues, are trying to get affordability back into focus. “Hopefully this survey will . . . explain in a very clear way to the public at large what affordability is and what we should be aiming for,” Pavletich said. By doing the study, the authors were also able to compare affordable and unaffordable cities to see what was being done right, or wrong, Pavletich said. In unaffordable cities, the key problem was the “strangulation of land supply” by local government, Pavletich said. Not allowing enough land to be developed was creating an artificial scarcity which is driving prices up, he said. Three cities in Canada made the most affordable list with Winnipeg in third place worldwide with a house price to income ratio of 2.4, followed by Edmonton and Quebec City, tied at 14th with an index of 2.8. The United States, with the world’s most unaffordable real estate, also had the most affordable, with indices of 2.2 in both Buffalo and Rochester, N.Y.
Pavletich hopes the survey will get people to question housing affordability and urge governments to actually set housing affordability targets. Companies that carry the data are talking about charging Canadians extra for everything from streaming audio and video to Voice-over-Internet Protocol (VoIP) phone calls and online gaming. Anything that uses bandwidth is under examination. The added charges being discussed are the result of too much traffic riding on the networks for free, says Lawrence Surtees, director of Canadian telecom and Internet research with Toronto-based technology analysis company, IDC Canada. Tom Copeland knows first-hand about the additional costs. Copeland is the chairman of the Canadian Association of Internet Providers, and owns Eagle.ca, an ISP in Cobourg, Ont. Copeland purchases his high-speed services from a third party that charges him a per-customer rate as well as a per-gigabyte rate for what his customers download. Copeland says he has one customer who uses $250 of bandwidth monthly. The problem isn’t that Copeland has to deal with that one customer, it’s that he has to maintain the bandwidth to deal with that high volume — regardless of whether it’s being used. “Certainly the bandwidth costs do have an impact on our bottom line,” he says. The same issues impact carriers large and small. Telus spokesman Shawn Hall says three factors come into play: the size of the Internet pipe and access speed, amount of data being downloaded in a month and priority access during high-demand periods. “The industry has to move toward different charges for Internet customers with diverse needs,” he says. Currently, ISPs and telcos are creating a new network, says Hall. Telus is laying down new fibre at a cost of several million dollars in an attempt to smooth out the transmission of applications such as VoIP and video streaming. Hall says the Internet was originally created for low-bandwidth applications such as e-mail and web surfing. Today’s more bandwidth-intensive applications don’t tolerate delays in data transmission or dropped data packets that result in choppy streaming or poor voice quality. – The Internet was originally created for low-bandwidth applications such as e-mail and Web surfing. Today’s applications are more bandwidth-intensive. – The added charges being discussed are the result of too much traffic riding on the networks for free. – Three factors come into play: The size of the Internet pipe and access speed, amount of data being downloaded in a month and priority access during high-demand periods. Telus spokesman Shawn Hall says three factors come into play: the size of the Internet pipe and access speed, amount of data being downloaded in a month and priority access during high-demand periods. Telus is considering adding a quality-of-service charge or tiers of service tailored to different customer needs, Hall says. The company is also thinking about charging large firms such as Google or EBay for access to its network, something that Bell South and AT&T are also proposing in the U.S.
You are currently browsing the Les Twarog Vancouver Real Estate and Condo Blog blog archives for January, 2006.